I am just getting into traversing through XML documents to learn how to use xpath. I have stumbled on to a issue. Everytime I try to execute my xpath it returns null as if it didnt find anything. I've tried the xpath out in XMLQuire and it worked there. I commented out the other xpath I tried, I've tried those two and both are returning null why is that? Here is a image showing the part of the DOM I want to access. As mentioned in the comment, the <tbody> element is generated by a browser developer tool. 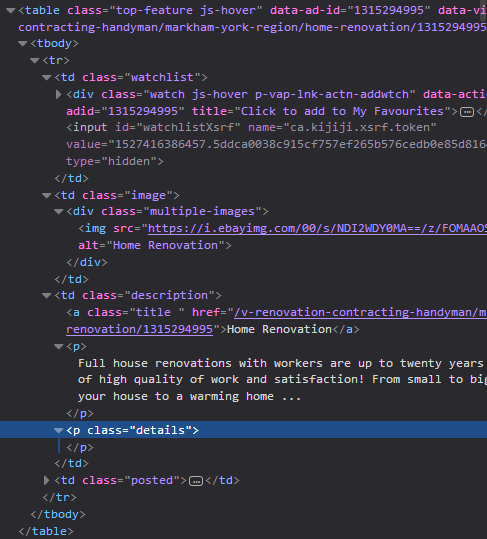 If you look at your var DOM object during runtime with the debugger, you can see the InnerHtml property.